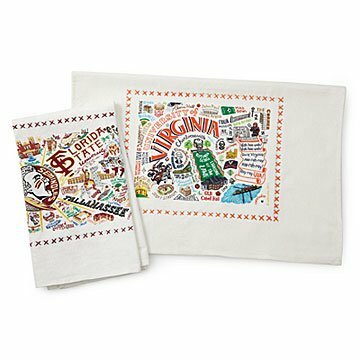 Celebrate your alma mater or even driving your kiddo to college with this vibrant collegiate dish towel. Celebrate your alma mater or even driving your kiddo to college with this vibrant set of collegiate dish towels. Brimming with mascots and logos, each towel is a vibrant collage of iconic names, images, and landmarks that will help you remember the things that make your school special. Each towel is silk screened and then framed with a hand embroidered border on a 100% cotton dish towel. Made in India. Click here to see all available College Dish Towels. Amazing product, just like everything this company makes! A great gift--I love that they make them for colleges now! Our son in law is a Purdue alum and likes to cook. He loved the towel and can show his son all about Purdue with the dishtowel. These college towels turned out great and were the perfect gift for a few college friends. Good quality and shipped quickly. Brought tears to mom's eyes.. This was such a perfect gift for my mom. My parents and myself all went to Virginia Tech so it's more than just a school for us. We are all so sentimental when it comes to our beloved alma mater and my mom cried as she strolled down memory lane reading every last syllable on the towel. Both of my parents were so impressed by the attention to detail. It truly seemed like only an alumni as proud as we are are to have attended Virginia Tech could have created this towel. Cannot recommend this enough, such a unique and special gift. My mom has already proclaimed that it's getting framed and will never actually be used as a towel! This towel is perfect for the Sooner fan - from the "Bizz" to Campus Corner. It will bring back great memories for sure!! BOOMER!! The perfect gift for the Clemson Tiger Fans in my life! Perfect gift for the Clemson Tiger Fans in my life! The OU towel is awesome. I know our sooner fsn will be so happy with this! Perfect gift for a U of A Fan! I purchased this for my friend who is a Univ. of Arizona alumni. It was between this towel and the State of Arizona towel, also offered on UG. I went w this one bc the state towel had a picture if their arch rivals, and that wouldn't work! She loves it and commented that it is really well made.